A few years back, Wes Borland quietly dropped Crystal Machete, a concept album for a non-existent 80s horror film that fused post-rock with electronic music. He hardly did any press for the record, choosing instead to let the album’s sonic textures and rhythms speak for itself. One could hardly fault Borland, given the visibility of his work with Limp Bizkit, the band that brought him fame, but also the opportunity to follow his muse. Recently, Borland’s muse led him into a four-hour durational set for Moogfest, an annual festival celebrating electronic music, art, and technology. Some of the set’s atonal drones, dark passages, ambient releases, and organized chaos will find its way onto Borland’s forthcoming album, Astral Hand. Alongside drummer Alex Rosson, Borland lorded over a truly massive area of electronic gadgetry, both retro and futuristic at Moogfest. Modern samplers, ancient guitar effects pedals, a cassette deck, drums, synthesizers, and more samplers could all be seen in a massive working area. And there wasn’t a laptop in site to connect and synchronize the disparate parts. While Borland is primarily known as a guitarist with his various projects, the improvised, four-hour Moogfest set found Borland using the guitar as a sound generator. In an interview with Louder in 2016, around the time of Crystal Machete’s release, Borland professed his love for electronic heavyweights like Boards of Canada, Air, Tangerine Dream, and Vangelis. It’s long been known that Borland’s musical tastes and other interests are quite eclectic. But with the aforementioned interview, Borland sounded like he had much in common with metal icon Justin Broadrick (Napalm Death, Jesu, Godflesh), whose Jesu and Techno Animal projects allow him to explore his more experimental sonic tendencies. Borland traces his experimentalism to Jan Hammer’s electronic scores for Miami Vice. Growing up in the 1980s, he enjoyed Hammer’s synthesized compositions, with their moody and glossy veneer. But Borland, as he puts it, quickly went “full metal” in his teens. If there was a keyboard in a band, he scoffed at it, assuming the music sucked by default. He couldn’t even listen to a track like Ministry’s “Thieves,” with its sampled and sequenced elements, without quipping that the band wasn’t actually playing the song. As the years passed, Borland ditched the purist player mindset, and re-embraced programmed electronic music. Now he listens to music as something like an eternal student. Between the ages of 16 and 18, Borland constantly recorded and stockpiled tapes. He carried a mini cassette recorder around everywhere, recording people, initiating conversation, trying to get people to talk about any number of things. For months, Borland tried to get people to talk about head cheese, a meat jelly made from the head of animal. He also recorded the VHS tape soundtracks of films like Texas Chainsaw Massacre to cassette, then played them on his car stereo. Around the same time, Borland and his brother launched a project called Goat Slayer. The goal was to make a record in one night. Borland says the experiments got to be too good, so Goat Slayer started making rules, or limitations. They made a musical obstacle course inside Pro Tools, where each would drop sounds, like a beat or “some terrible noise.” Borland and his brother would then turn the screen off, so they didn’t know what was coming, and hit record. Borland’s boyhood experiments, from the cassette field recordings to the Goat Slayer jams, were clearly in the sonic DNA of his durational set at Moogfest. 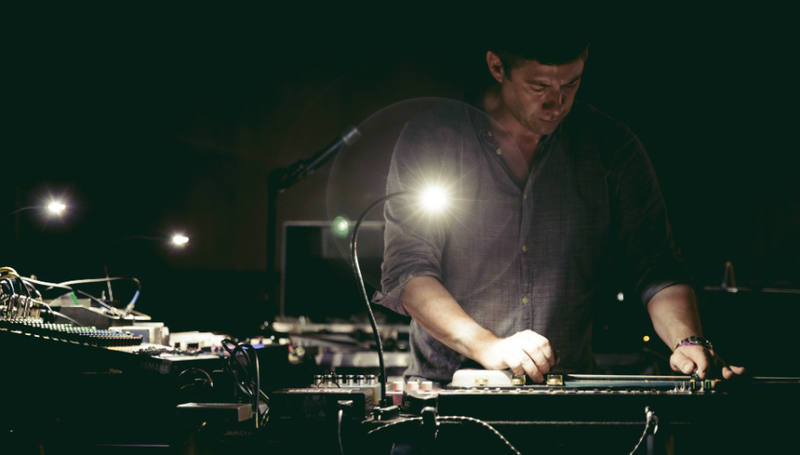 He spent a great deal of time moving from one piece of hardware to another, creating a strange atmosphere of sound. While Rosson triggered random, pre-loaded samples on an Akai MPC Live and added equally random percussive elements on the drums, Borland dropped many other electronic elements in and out of the mix throughout the performance. The main part of his system is a 16-channel console, with many sounds routed through an Echoplex, a very old but still amazing tape delay system famously used by Portishead’s Adrian Utley. Other sounds get routed to a reverb and looper pedals. Borland also loaded up two other Akai MPC Live’s with a wide variety of sampled sounds. Borland also used a lap steel with its own looper and effects chain, and a vintage Moog Taurus 1, an analogue bass synthesizer inspired by an organ’s pedal board. The Taurus is all over Crystal Machete, and will also factor heavily into the sound of Astral Hand. In the live setup’s original, pre-Moogfest configuration, Borland used a number of synthesizers. But the day before the set, Borland decided to ditch them for a briefcase full of tapes that he could select and play on his cassette deck at random. When it was all said and done, Borland enjoyed playing live electronic music, and plans on doing more of it in the near future. For now, he has two upcoming 30-minute sets opening for A Perfect Circle before he heads back into the studio to put the finishing touches on Astral Hand. Matadors and Daughters by Wes Borland is out now.